July sees the opening of local photographer Harry Trout’s first exhibition on King Island. Harry is currently taking photographs in the UK for his latest book about England but he’s due to return home to King Island next week to start setting up for his opening night on July 14th. Everyone is welcome to the eagerly-awaited opening of this exhibition which will feature work taken over several decades and continents. The title of Harry’s exhibition, Alive or Just Breathing, was inspired by graffiti he spotted in Melbourne but also says something about the vigour and vitality of Harry’s work. With more than 100 works on display Harry had better not be too jet-lagged on his return from the Northern Hemisphere as he’s got his work cut out readying the two galleries. This also means that this is your last opportunity to enjoy Memento which features objects chosen by King Islanders which evoke strong memories. The eclectic range of objects is accompanied by often emotional or amusing stories which relay the importance of the piece. 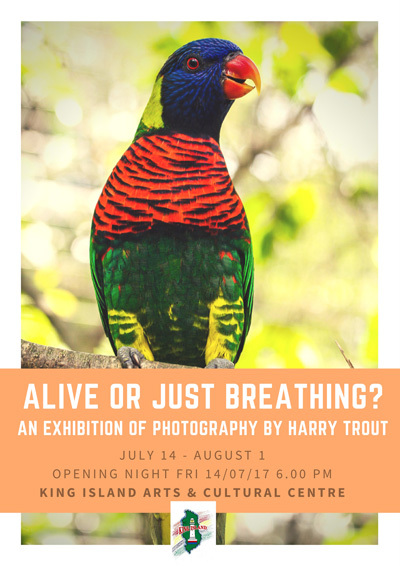 Alive or Just Breathing opens on Friday July 14th at 6.00 PM.